Mpow might not have the brand recognition of companies like Beats and Bose, but it does have something even better that neither of those companies have. 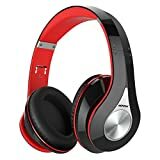 Mpow has the honor of having made the best-selling headphones on Amazon’s entire site for almost two years now. The Mpow 059 Bluetooth Headphones offer killer sound, great battery life, and a sleek design at a fraction of what you would pay for comparable wireless headphones from Bose or Beats. And if you use the BGR Deals team’s exclusive coupon code BGRMPOW1 at checkout, you can get them at their lowest price ever, just $27.99. IMPRESSIVE SOUND QUALITY IS THE ULTIMATE GOAL: The High-fidelity stereo sound benefits from the 40mm neodymium driver, CSR chip, and the around-ear cushion design which provide a well-closed and immersed enviroment for your ears, Just lose yourself in the music!